This week I am excited to attend Vistakon's Women in Optometry Focus Group, and it is excellent timing that so much is going on within the company this year. On October 6th, Johnson and Johnson launched broadened parameters in its popular 2 week lens brand, Acuvue Oasys for Astigmatism. For those of you with higher amounts of astigmatism this lens could help you attain better vision without the need for more expensive custom lenses. The Oasys for Astigmatism lens is now available in 10 degree axis options around the clock in all cylinder ranges up to -2.75. In the past, only the older generation Soflens 66 Toric offered -2.75 cyl options without being custom order, and this brand's -2.75 range is now limited to minus spherical powers. 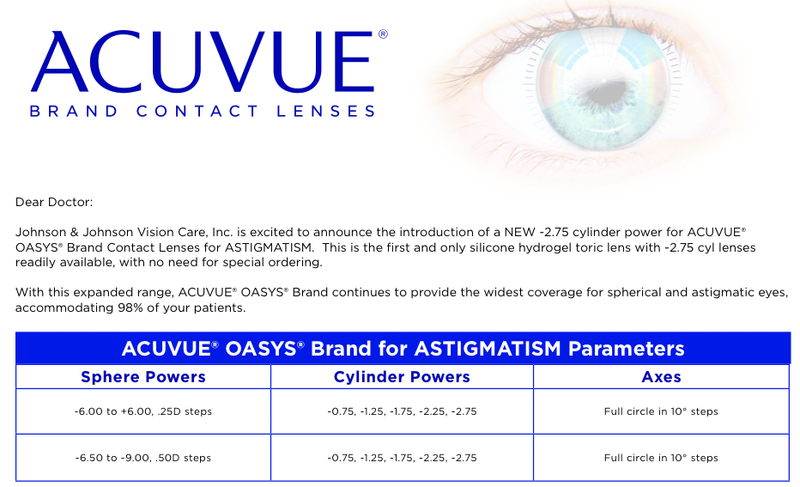 Acuvue Oasys Astigmatism now offers up to -2.75 cyl in powers from +6.00 to -9.00 to cover a broad spectrum of lens wearers. If you have high amounts of astigmatism, the larger parameter range of Oasys for Astigmatism may give you the option of wearing inexpensive disposable soft contact lenses without sacrificing visual clarity. While custom lenses are often needed for people with higher prescriptions to achieve best vision, broader lens ranges means less people needing these more expensive custom options. Johnson and Johnson reports that up to 98% of an average doctor's patients would fall into a prescription range offered in the Acuvue Oasys line with this new extension. In my experience, astigmatism amounts up to -3.50 could be happily corrected with a -2.75 astigmatism contact lens with good success. Looking for more contact lens updates? Stay tuned this week for more information from the Acuvue Women in Optometry event.